History, they say, repeats itself. In Afghanistan we were told the Taliban, by aiding and abetting Al Qaida’s leadership had indirectly contributed to the attacks of 9/11. Months later, US-UK unilateral intervention in Iraq, motivated by the presumed, now categorically disproved, presence of Weapons of Mass Destruction, left a nation already scarred by internal divisions and the rule of a ruthless tyrant in utterly devastated. In Afghanistan and Iraq, NATO and American forces carry the burden of a ghastly legacy. Millions have died to achieve objectives we have yet to fully comprehend, let alone see on the ground. 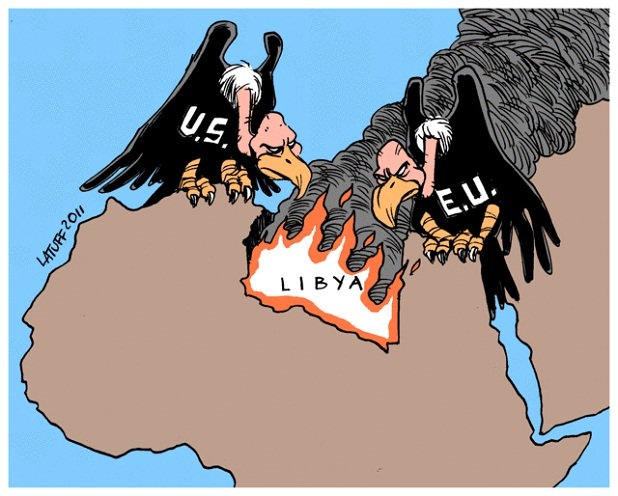 Nonetheless, the dawning of a ‘limited’ intervention in Libya over the past week through the enforcement of a ‘no-fly zone’, tells us that little from these past two experiences seems to have been assimilated by Western capitals. The rise of the Arab spring has given observers in the Arab world hope that Arab populations themselves could finally be the actors of the change they so desperately needed. As autocrats in Tunis and Cairo fell within less than six weeks, it seemed only a matter of time before Muammar Gaddafi announced he was retiring to any African state willing to welcome him. As days turned to weeks, a peaceful revolution turned into a protracted battle with each side aiming to control key cities of the country. As Gaddafi began to regain the upper hand, the international community found itself between a rock and a hard place. Though his departure seems to be the only thing anyone can agree on, the methods through which this is accomplished is far from generating any consensus. In the midst of all of this, Libyans seem to be the ones held hostage, between the gluttony of their leaders and that of outside powers with unclear intentions. The reality is that Libya, like Iraq, is a nation with a highly diverse ethnic and tribal landscape. We are told by the French they are coordinating their efforts with ‘rebels on the ground’. Who are these men of the ‘free rebel’ council the coalition says it’s dealing with as partners on the ground? Who has given them such a mandate? What do they stand for? Local envoys of international media organisations point to similarities between the rebel council and the Gaddafi clan’s methods of governance. Though only in its early days of existence, the armed rebellion’s leadership is already a divided one; rife with nepotism and tribal connections, its authority is bound to erode in the coming weeks. What’s more , as divisions within the coalition as to whether or not Gaddafi himself was a legitimate target were laid bare, I was of those to wonder just what on earth was going on within the higher echelons of NATO’s hierarchy. Surely one must ensure a workable political agenda is intertwined with military objectives to ensure Libya, in a post-Gaddafi era (if indeed this is what NATO is aiming for), is stable. In its suspicious rush to go to ‘war’ the coalition has failed to spell out its objectives, the time frame in which it hopes to operate, who will head its military operations and worst of all, any politically viable exit strategy. With Russia, China, Brazil and Germany opposed to the Security Council’s resolution on military action in Libya, France, in a role almost contradictory to its foreign policy traditions, emphatically led the charge as it hammered through to a start to operations against key Gaddafi targets. One can only explain such enthusiasm by President Sarkozy’s faltering domestic standing. Overwhelmed (willingly) by the Tunisian and Egyptian uprisings, facing public anger over his handling of the economy and confronted with what looks to be brutal electoral losses ahead, it seems the French president has gone so far as to launch a foreign intervention to shore up his approval ratings. What is one to say of David Cameron, whose campaign to 10 Downing Street championed fiscal restraint and blasted foreign military intervention as costly luxuries the United Kingdom could not afford? It seems the temptation to appear a world statesman was too great for the conservative. Surely Barack Obama, concerned ‘above all’ with America’s standing in the region, should know that the very idea of American fighter planes carrying tomahawks anywhere near an Arab conflict is an image to be avoided at all costs? Finally, the Arab league, needless to say, served as the eternal rubber stamp to validate NATO’s intervention only to condemn it days later, realizing that Arab public opinion was hostile to the idea. In the longer run there exist two major risks that NATO leaders must immediately examine if they are to bring any sort of legitimacy to their actions. There is the imperative to avoid the death of innocent civilians, which needless to say will only antagonize local populations and harvest support for Gaddafi as a ‘hero’ resisting imperialism. Furthermore, should the coalition fail to maintain any consensus amongst the country’s major tribal leaders, it runs the risk of reshaping Libya’s and indeed the region’s delicate power balances, thereby creating a chaos of greater proportions. Though there is a necessity to remove the Colonel and those loyal to him from power, are the methods being used tailored to the country and can they avoid the risks I have pointed to? Therein lays the problem. Whilst we cannot and should not ever condone foreign military intervention neither should we support inaction. The world simply cannot stand by and watch as a population faces the full force of Gaddafi’s military arsenal. It’s hardly a secret to anyone now that neo-liberal, humanitarian interventionism is held hostage by geostrategic and political objectives which often render it illegitimate and certainly counter-productive. Though I am the first to understand and defend such a noble idea of aiding those unable to defend themselves, I certainly am all too aware of the real imperatives and double standards surrounding interventions’ modalities. These double standards have left a well-wishing public opinion, myself included, skeptical of Western powers’ good faith in undertaking such interventions. Ivory Coast, Bahrain, Yemen and Syria are currently the theatre of blind murder by the authorities, and yet not much as one word is being said to remedy these injustices. Israel is a nation that has never heard so much as one condemnation for its aerial bombing of innocent civilians in Gaza and yet this is something Gaddafi will now pay for, and at a very high price. Certainly all the states I mentioned earlier should be held accountable for their disproportionate use of force against their own and/or occupied populations through the creation of a no-fly zone. Or is it that some states are more sovereign than others? In short, it is far too evident that Western powers are only ready to act decisively when it suits their interests and those of their businesses and, sadly enough, at the expense of their own citizens’ taxes/opinions. To paraphrase a friend’s wry comments, perhaps we are witnessing nothing more than a well conceived and well executed business plan. Step 1: Sell tyrant countless weapons, Step 2: hope or make it so that he becomes a threat, Step 3: destroy the arsenal just sold to him Step 4: provide the new regime with new weaponry. Step 5: reap the financial and geostrategic reward of being the ‘liberator’. Congratulations Kateb. I carefully read your article and it seems that you capture the feelings and the anger of many the people around the world with what is going on in the Arab world and the double standard of the western when it comes to the middle east and North Africa. Your conclusion on the five’s steps reflect the reality on the ground and history certainly will confirm this hidden agenda. is the resolution adopted by the Security council giving the NATO the right to intervene while the so called arab League clearly mentioned that they do not any foreing intervention? Huh?? “failed to spell out its objectives”?? Isn’t there a UNSC resolution 1973 spelling clearly the objective, i.e. to protect the libyan civil society? And isn’t it clear, who ist threatening the lives of the libyan citizens by means never seen before in human history? There is a fundamental difference between the US/GB intervention in Iraq, the interventions in Afghanistan, Bosnia or Kosov: It has a UN mandate and, therfore, conforms with international law! You solely repeat, that there is nothing worse than “foreign intervention” as it allegedly violates the sovereignty of states who, therefore, can do internally with their people whatever they want. Being german I firmly dispute this standpoint: Without the endeavor of the “allies” in WWII germans would never have got rid of the Nazi regime (the majority favored this regime). As a result the powers gaining wwII victory cosntitued the UNSC. Since then a UNSC decision represents international law and, whoever feels capable, has the right to enforce the law. Therefore, the Libya mission is nothing else than a policing mission (it does not have the character of a unilateral “humanitarian” mission). Take off your glasses which force you to analyze the world solely through the prejudice loaden concepts of “antiimperialism”! You are may be right. May be not when we are following with graeat concern the developments on the ground. Yes, there was a UNSC resolution 1973 adopted with 5 countries absentention and the strong pressures made directly by the strong of the world of today to avoid the non adoption in the last moment. I don’t find any wording in the UNSC resolution which could give the mandate to the NATO to lead the coalition. One french minister, Gueant who is in charge of internal affairs, spoke about crusade.Should the double standard prevalais for one or an other raison, all the justifications you presented will not have any meaning. I read the resolution many times and there is nothing in it that gave the NATO the right to intervene. one question since you seem a human rights activist ,where are those countries when it comes to Ghaza and other poor countries without oil and Gaz?????????????? I understand your viewpoint but am surprised as to some of the flaws you find in my argument. I only mention sovereignty to highlight the double standards in the arguments used by some to intervene in some states and not others (e.g Israel is a sovereign state able to carry out its dirty business, others are not) . I do repeat on several occasions that intervention was necessary if not imperative in the face of Gaddafi’s bombing of civilians. I do not support the man by any means, have always been and am against him being able to massacre his people in a country cut from the world. This does not however mean that I cannot object to the means through which the intervention is being carried out. If Iraq and Kosovo are not the same as Libya you say, yet they thought us that the moral imperatives are only 50 % of an intervention’s ability to achieve something, the rest lies in the legitimacy of those who carry it out , how they do so and how they plan to leave the scene of the ‘crime’ so to speak. All of these issues, which I hope you can agree, are very important and make it so the intervention seems flawed to begin with. Maybe time – I certainly hope so -will prove me wrong. Thanks for your contribution in any case! That’s a good analysis, Kateb. I was interviewed on Al Mustaqillah TV the other night and I expressed similar doubts. Inaction, however, is not an option, as you suggest. What should the action be, though? Let the two sides battle it out? Yet, what do we do?